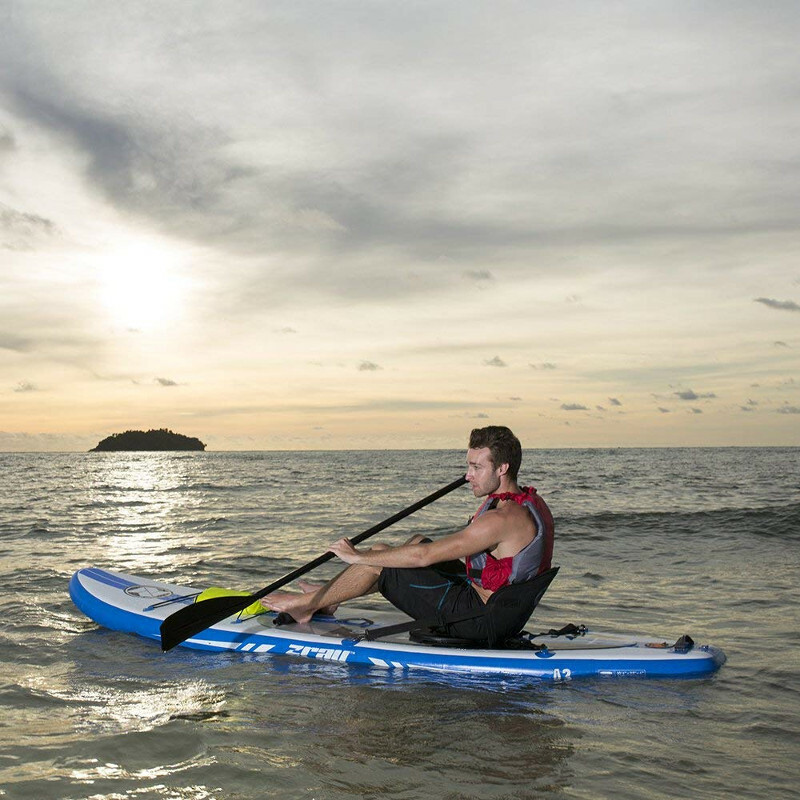 After a lot of work and innovation, the Zray Sports is here today with a strong industry line that includes not only inflatable stand up paddle boards, but also kayaks, boats and a bunch of accessories. Inflatable products are an attempt to boost comfort without compromising quality. The Zray Sports was well aware of that and chose to make some really tough and durable iSUPs for anyone who’d rather put practicality as a priority, yet, still enjoy the high end production and professionalism of the craftsmen behind the iSUP’s existence. 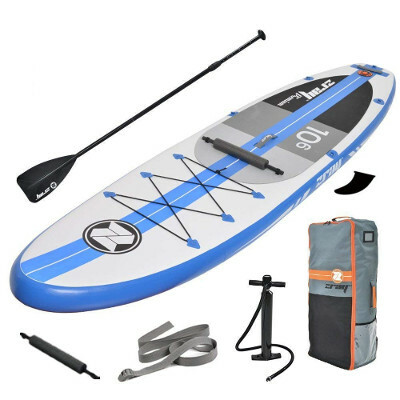 Today, we’re going to review the Zray A2 inflatable paddle board; one of their Premium line. A line that’s popular for how versatile its iSUPs, and for all the sizes in which they’re produced. 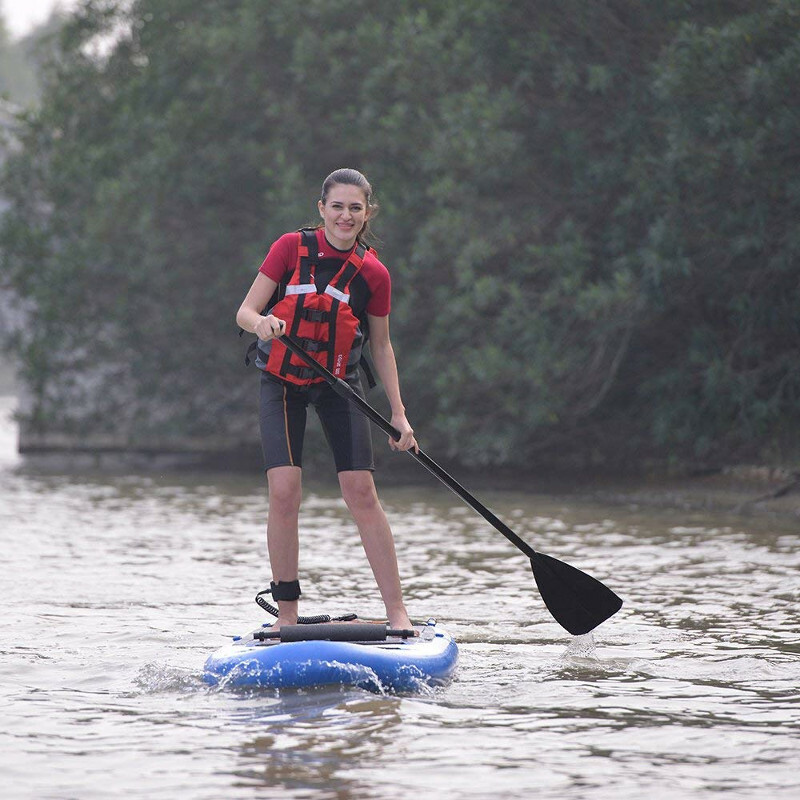 Light-Weight Aluminium Paddle, Adjustable from 65"-85"
The A2 is what we can call a professionally sized iSUP; it’s 10.6 feet long, 32 inches wide and 6 inches thick. It is made with almost everyone in mind; entry, intermediate and advanced levels. The dimensions of this board were carefully and wisely chosen to deliver great stability, maximum comfort and security for everyone. The thickness aspect here is unbeatable; it’s almost impossible to make a 6 inches iSUP bend or submerge under water when it fully inflated. As for width, it’s already proven that wider boards perform better when it comes to balance and stability. The A2 is 32 inches wide and that is definitely 2 inches above the norm, and that does make a difference once you’re in the water. Now speaking length; this board is nicely built into 10.6 feet which is literally ideal for anyone. A large man or a petite girl can easily and smoothly handle the A2. All of the Zray Sports’ iSUPs are made of military grade double layer PVC material that makes any inflatable product stiffer and stronger. Also, the First Quality Drop Stitch used to build the A2 is impressively tough and flexible at the same time, and that’s right there is the best of both worlds. You don’t have to go easy on a Zray; these boards can be run over by a car and not a single scratch would be laid on them. Once it’s fully inflated, the A2 turns completely tough and hard, yet; it can still be thrown over the top of a building and it would bounce its way out of it safely and soundly. A board like this one is technically meant to serve its purpose for years, and if you’re planning on getting a board for a life time, all you got to do is maintain your iSUP friendlily so it lasts longer. A navigation system that consists of 3 rigid fins; the central one is large and removable like usual, while the other 2 are fixed and smaller. The A2 gained quite a reputation for its smooth gliding and straight tracking, and that of course is thanks to the trio. Next, we have the traction pad that’s part of its look; it has 3 colors in it, and it covers half of the board’s back. It’s a rugged pad that adds to the board’s stiffness, and it also protects your feet and makes sure they don’t slide. Also, there is the famous tie-down system on the deck and it consists of 6 stainless steel D-rings connected with a bungee cord. 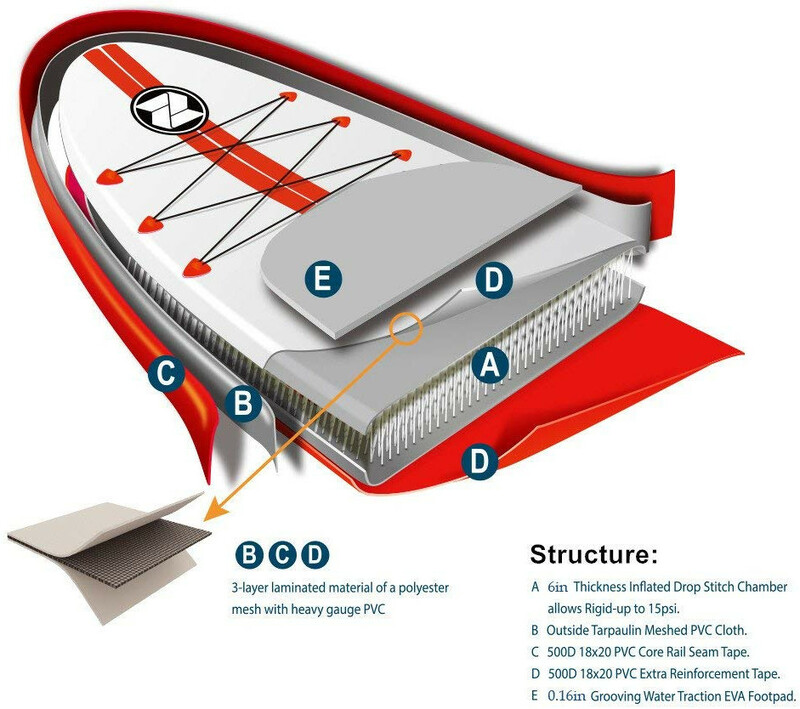 This feature works as a storage area for any kind of cargo. Now if you want to use a kayak seat or bring a cooler on board with you, there are another 4 D-rings at the sides of the board to work that out. In case a safety leash was needed, there are also 2 additional D-rings on the board’s tail for that purpose. If you like to sit and paddle your way through the water, Zray featured the A2 with a footrest space so that you can enjoy the most comfortable and practical paddling experience. The footrest can be easily attached/detached and it’s super convenient for long distance touring. Finally, the A2 is featured with 2 carry handles; a central one that’ll allow anyone to carry the inflated iSUP with one hand, and a second one on the board’s tail in case help was needed to drag or transport the iSUP. An adjustable aluminum floating paddle. A high pressure pump with gauge. A strap to keep the folded iSUP in place. It’s more or less a complete package which with no doubt is going to cover everything you need to start paddling the moment you receive the iSUP if necessary. Having reviewed the Zray A1 of the same line, I was able to notice the A2 is a little more stable than the first one. Moving around on top of the A2 is an easy task especially in flat water. The weight capacity is enhanced as well; the Zray A2 can hold up 320 lbs which could be a small passenger/pet with you, or some extra cargo. Now the slim body of the A2 made it possible for me to experience a little speed. However, other larger models can do better thanks to their extra length. To sum it up, the A2 delivered a really nice and neat performance with nearly no issues at all to be mentioned. The number one pro here is definitely the rugged and tough body of the A2. The Zray A2 is a wide iSUP (32″) with great stability. It’s featured with multiple D-rings to have anything secured to it including a kayak seat. It supports the kayak mode with a footrest for a more healthy and comfortable sitting position. It comes with everything needed to handle an iSUP. 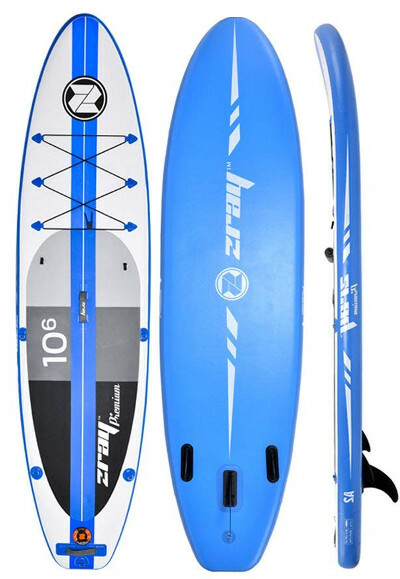 The traction pad on all of Zray Premium’s iSUP is relatively small; it covers only half the board’s back. It’s not bad at all; still, there are larger pads where you can be protected against slipping almost anywhere on the board. The package does not include a repair kit.